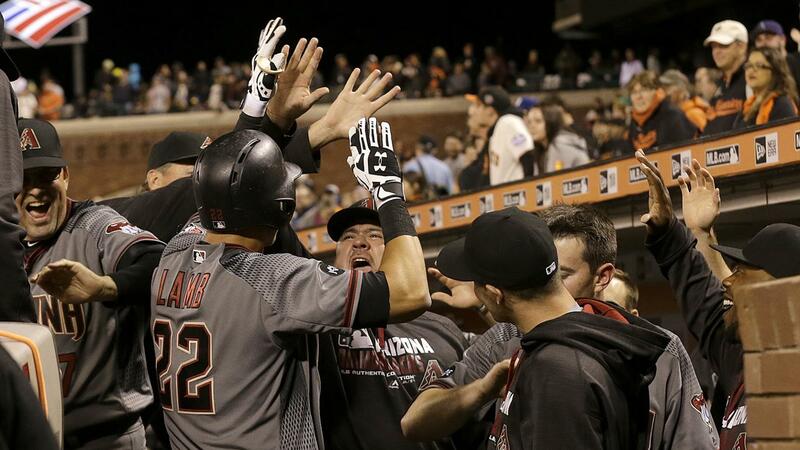 Jean Segura's third hit, an 11th-inning chopper over the pitcher's mound, scored Phil Gosselin with the tiebreaking run on Monday night and paced the Arizona Diamondbacks to a 9-7 victory over the San Francisco Giants at AT&T Park. "It was a good win," D-backs manager Chip Hale said. "The guys battled. We made some mistakes early. It was really exciting to watch those guys battle. Guys were into it in the dugout. It was a fun game." Gosselin singled off Giants reliever Chris Heston to open the 11th and moved to third base on a sacrifice bunt and a wild pitch. San Francisco was one out away from escaping the inning, but nobody had a play on Segura's high bouncer. Jake Lamb's double scored Segura and padded Arizona's lead. The Giants were one strike away from sealing a last-at-bat victory after Denard Span tripled to lead off the eighth inning and scored the tiebreaking run on reliever Daniel Hudson's wild pitch. However, with two outs in the ninth, Lamb homered on a 2-2 pitch to forge a 7-7 deadlock and hand Giants closer Santiago Casilla his second blown save in five chances. "That's a tough one, when you're a pitch away [from winning] and they tie the score," Giants manager Bruce Bochy said. Lamb chops lead: Down to the D-backs' final strike, Lamb delivered a game-tying homer in the ninth and he drove in an insurance run in the 11th as part of a three-hit night. Hale moved Lamb to the two-hole Monday for the first time this season, and it paid dividends. "I got down two strikes. I was just trying to put something in play, get something going," Lamb said of the ninth-inning homer. "I honestly thought it was a changeup because there was so much movement. I went back and [looked], it was a heater at 92. It was over the plate, and I was just trying to barrel something up and it left the park." Start him up: The Giants entered the game batting .218 with nobody on base. This didn't matter to Joe Panik, who homered to lead off the fifth inning, when the Giants broke a 2-2 tie by scoring four runs. Rough first: The Giants really made D-backs starter Archie Bradley work in the first, drawing three walks and collecting a single. Bradley somehow managed to get out of the inning without allowing a run, but the 35 pitches he had to throw in the frame played a big part in his not making it through five innings. "You look most of my bad starts, it's a bad start from the beginning," Bradley said. "I think a key for me is to get going early and have success. Never could really get comfortable, never could really find it and had to battle all night." Powered by Peavy: Giants starter Jake Peavy kept things lively during his five-plus innings. On the mound, he surrendered four runs but kept the Giants in the game. At the plate, Peavy was even more effective. He singled to start the Giants' two-run uprising in the second inning and drew a bases-loaded walk to force in a run during their big fifth. "I take it serious to try to contribute on that side of the ball," Peavy said. "I understand what it's like to be out there as a pitcher, and if another pitcher can handle the bat, that's one more thing you have to worry about." It didn't take long for the game's first challenge as Segura led off the first with a grounder to second. Segura was called out at first, but the D-backs challenged the call, and it was overturned after a quick review. Segura wound up coming around to score to give Arizona a 1-0 lead. Hale wasn't so fortunate in the seventh, when Brandon Crawford was awarded a double after he sneaked a grounder inside third base and a fan leaning over the short wall in shallow left field interfered with the play. The D-backs challenged Crawford's placement at second, believing it should have been limited to a single, but the call on the field was confirmed. D-backs: Robbie Ray will get the call when the series continues at 7:15 p.m. MST on Tuesday. The left-hander is still looking for his first win of the season despite a 2.92 ERA. Giants: Matt Cain, who recorded his first career victory over the D-backs on Sept. 4, 2005, will go for No. 98 on Tuesday against Arizona. The right-hander owns a 14-7 record with a 3.49 ERA in 34 career outings against the National League West rivals.